Creating a unique hotel bathroom can be tough. Guests are accustomed to functionality and attractive bathrooms. The combo can be hard to find and hard to build, so hotels have turned to offering more unique designs in order to impress more people and get their bathrooms posted on social media. You know you have made it in the hotel world if guests are posting photos of your guestroom restrooms! Windows are extremely important in creating a unique restroom. Natural light is a natural happy drug that gives guests a sense of warmth and welcome. When windows are floor to ceiling, it makes the entire bathroom feel bigger and the guest feel like a VIP. People seem to absolutely love the tall windows. The brighter a space, the better the atmosphere of the room. This type of not only creates awesome visual effects, but at the same time creates a sense of freedom for guests by making the room appear bigger. Be careful though, these floor to ceiling windows should only be used on the higher floors, no one wants pedestrians peeking in! More and more high-end hotels are beginning to place the bathtub next to the window. Of course, the window has to be low enough to meet the edge of the tub in order for guests to get a great view from the bathtub itself. When guests have the option to check out the view and scenery while relaxing in a beautifully built bathtub, they appreciate the layout and uniqueness even more. Who wouldn’t want to enjoy a nice hot bath while watching the waves crash outside their hotel room window? It’s like being in a hot tub, but better! Bath bombs, bubbles and a view. Yes, please. The claw foot bathtubs have been back in style now for a few years. The really high end, luxury hotels are placing them in guest rooms in order to make the guest feel like a VIP. It gives the room an old fashioned vibe. From Old Western to Victorian, clawfoot tubs bring in character, class, and history all in one! Most people do not take baths, but when they see a clawfoot, gorgeous, porcelain bathtub, how can one resist? Think about an organic, upclycled, reclaimed wood design. The look alone creates a friendly and comforting vibe. On top of that, using reclaimed wood throughout a bathrooms design is extremely environmentally friendly. With this kind of wood, throw in all types of green plants and white tile to give the guests a refreshing and clean feel. Using reclaimed wood is more cost efficient and will absolutely come across as unique in guests eyes! The most unique hotel bathrooms, if you have not noticed have one thing in common. The shower and the bathtub are separated. By doing this, hotels are creating two completely different hygienic experiences and providing guests with more options for their bathroom ventures. 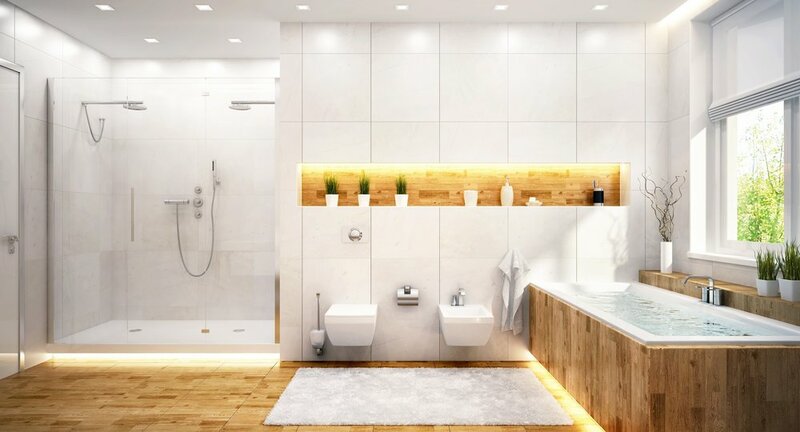 Keeping up with all of the ways to be unique is definitely a challenge, but pretty soon having a consistent layout in the bathroom will be unique in itself!